Samsung Flat-panel TVs with 30 channels of HD programming. Easy-access Plug-and-Play feature makes it simple to connect electronics. 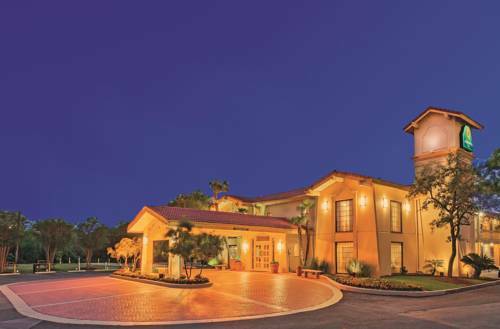 Located just west of Downtown San Antonio adjacent to the Lackland Air Force Base gates, the La Quinta Inn San Antonio Lackland is convenient to all area attractions. Spend the day at SeaWorld San Antonio and the Brackenridge Park and Zoo. Explore the Riverwalk, the Alamo, Market Square, the King William Historic District, and the Institute of Texan Cultures. There is always something happening at the Alamodome, the Henry Gonzalez Convention Center, SBC Center, and Nelson Wolff Stadium (home to the Texas League Champs San Antonio Missions! ); it's not far to the Golf Club of Texas or Quarry Golf Course; and within a 20 minute drive you find neighboring cities like La Coste, Castroville, and Hondo, TX. Enjoy a Free Bright Side BreakfastTM every morning in the beautiful lobby dining area at the La Quinta Inn San Antonio Lackland. For your enjoyment, we have a picnic area and two sparkling swimming pools (open year-around). You won't find nicer rooms anywhere; they come with free high-speed Internet access, a coffee maker, hairdryer, iron/board, and more. We also have a brand new fitness facility and guest laundry. Fax/copy services available through our friendly staff at front desk. Must cancel by 6pm (hotel time) to avoid fee. ~25 miles from San Antonio. ~42 miles from San Antonio. ~62 miles from San Antonio.